If you’ve spent any length of time underwater, you appreciate just how much drag it creates on your limbs — especially if you’re wearing a little clothing or carrying around diving equipment. Now, try to imagine using a pressurized spacesuit in that environment. You’re already puffed up like a balloon and have the drag to contend with. Few of us will get that experience — NASA won’t let just anybody try on an expensive suit — but luckily for us, a person saying he is a diver (identifying himself only as Zugzwang5) posted about the experience on Reddit. The pictures alone are incredible, but the insights the diver provides show just how tough an astronaut has to be to get ready for spacewalking. Using the spacesuit compared to a wetsuit, wrote Zugzwang 5 on Reddit, was “incredibly cumbersome”. He says he’s a contracted diver for Oceaneering working at NASA’s Neutral Buoyancy Laboratory in Houston, which has a model of the International Space Station in a huge pool for astronauts to practice spacewalking. Usually he’s inside a wetsuit, but the spacesuit was a completely different experience, he said. There’s so much resistance from the suit and the water every motion takes tremendous effort. You might not guess it from my pictures, but I’m actually pretty fit, and I was exhausted by the end of the day. The hardest thing to get used to was moving up and down in the water column. I’ve been diving so long controlling my buoyancy is basically a force of will at this point, having to actually crawl and direct myself up and down was such a weird feeling. Near the end of the marathon session, the diver had to bring back a simulated “incapacitated” astronaut to the airlock underwater, which he wrote was an extremely difficult task — especially while so tired. So, for a real astronaut to pass their final evaluation they have to do a flawless incapacitated crew member rescue. this is actually very difficult as safely manipulating another suit is even more tiring and cumbersome than just moving your own. not only that but the airlock is very small, and safely (using proper tether technique) hooking someone else up into it is a surprisingly complex procedure where you have zero extra space to work with. Thirty minutes usually ends up being hardly enough time for the new guys, and even a vet will take more than 20. You can check out the entire gallery at this link. Also, look at a past one the diver posted about the spacesuit fitting. Just about any space mission these days requires water training. 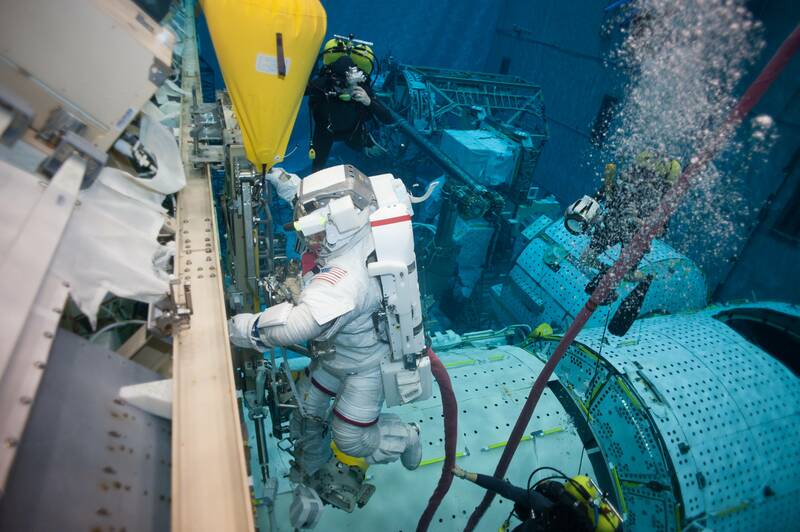 Think of the countless hours astronauts spend in the Neutral Buoyancy Laboratory at the Johnson Space Center, practicing the steps to do spacewalks. Then there are the crews that actually live in the ocean for days at a time on NASA’s NEEMO missions. Long before these “aquanauts” added flippers to their list of equipment, however, the U.S. Navy was busy exploring the depths of the ocean. 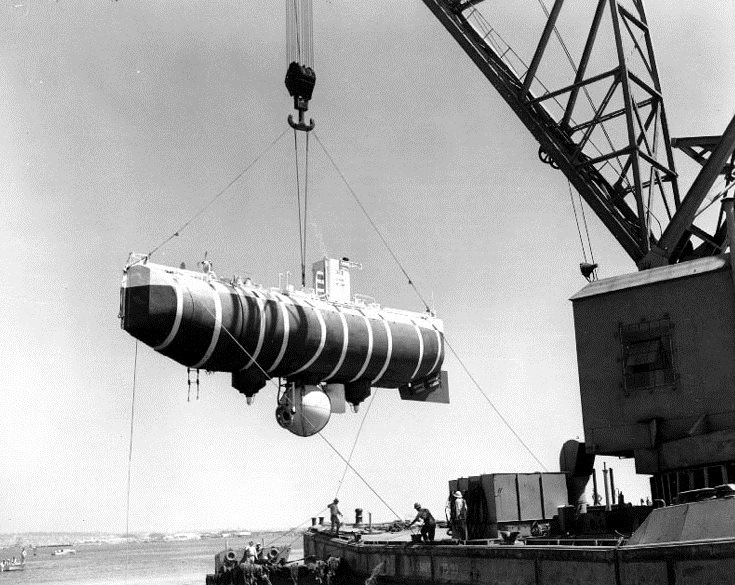 Today – Jan. 23 – marks the anniversary of the Bathyscaphe Trieste’s descent to the bottom of the ocean in 1960. This was the first time a vessel, manned or unmanned, had reached the deepest known point of the Earth’s oceans, the Mariana Trench. Trieste was at first operated by the French Navy, which operated it for several years in the Mediterranean Sea, but the US Navy purchased the Trieste in 1958. Although two men took the ride down, all accounts say that it was an isolating experience. Jacques Piccard – well-known today for his exploration of the oceans – and US Navy Lieutenant Don Walsh descended about 11 kilometers (7 miles) to the bottom. Lt. Don Walsh, USN (left) and Jacques Piccard (centre) in the bathyscaphe Trieste. Via Wikipedia. Fighting with poor communications and high pressure – which cracked a window at 30,000 feet below the surface – the crew made their way to ocean floor. They worked in a tiny sphere only 2 meters (6.5 feet) wide, and according to the University of Delaware, the interior reached frigid temperatures of 7 degrees Celsius (45 degrees Fahrenheit) during their successful descent and return. Spaceflight and deep-ocean diving share many similarities, as this mission demonstrated. The early days of the space program had communications blackouts as spaceships flew between stations; this proved to be a near-disaster for the Gemini 8 crew in 1966 when their spacecraft spun out of control during a period with no voice connection to the ground. Also, sustaining life is no less challenging in the water as it is in space. Humans require oxygen, pressure and a comfortable environment where they work. Crews in space have faced serious problems with all of these matters before – Mir suffered a partial depressurization in 1997, and the early days of the Skylab space station were rather hot until the astronauts could deploy a sunshade. Walsh was not available for an interview with Universe Today due to travel, but in a 2012 BBC interview he noted that he had reserved confidence that they would make it to the bottom. “I knew the machine well enough, at that point, to know that theoretically, it could be done,” Walsh recalled. The mens’ feat would go unrepeated for decades, until in 2012 Hollywood director James Cameron made the descent again – alone, although certainly equipped with more modern technology. For comparison, only one American has flown solo in space since the 1960s; in 2004, Mike Melvill piloted SpaceShipOne into suborbital space twice as part of the Ansari X-Prize win.